Starring Dana Andrews, Janette Scott, Kieron Moore, Alexander Knox. Produced by Bernard Glasser and Lester A. Sansom. Screenplay by Jon Manchip White and Julian Halevy. Story by Jon Manchip White. Executive Producer: Philip Yordan. Directed by Andrew Marton. Classic Sci-Fi In The Tradition Of "Journey To The Center Of The Earth" And "When World's Collide"
From The Director Of "Around The World Under The Sea" And The Original "The Thin Red Line"
Dr. Steven Sorenson (Dana Andrews) and his wife and fellow scientist Dr. Maggie Sorenson (Janette Scott) plan to utilize the geothermal energy of the Earth's interior by detonating a powerful thermonuclear device deep within the Earth's core. Despite warnings by Maggie's ex-flame and fellow scientist Dr. Ted Rampian (Kieron Moore), Dr. Sorenson proceeds with the experiment after he secretly learns that he is terminally ill. This experiment causes a crack within the earth's crust and threatens to split the earth in two if it is not stopped in time. Director Andrew Marton (The Thin Red Line) was most famous for directing the classic chariot race in William Wyler's Ben-Hur as the second-unit director. 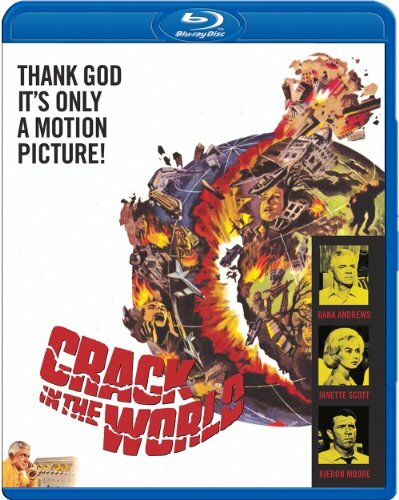 Paramount Pictures Presents Crack in the World Starring Dana Andrews, Janette Scott, Kieron Moore, Alexander Knox. Produced by Bernard Glasser and Lester A. Sansom. Screenplay by Jon Manchip White and Julian Halevy. Story by Jon Manchip White. Executive Producer: Philip Yordan. Directed by Andrew Marton. A Paramount Release Copyright © 1964 by Paramount Pictures Corporation and Security Pictures, Inc. All Rights Reserved.